For those of you that like games of skill such as poker or found the movie “A Beautiful Mind” fascinating, you may be interested in this Ustream webcast going on tonight sponsored by UCLA Engineering/UCLA Math. Both Chris Ferguson (UCLA PhD – 2000 World Series of Poker Champion) and William Chen (Well known Professional Poker Player) will be in attendance along with 2 of my former profs, Professors Korf & Kleinrock. Professor Kleinrock is one of UCLA’s most famous active professors and is most notably known for being one of the founding fathers of the Internet. He created & operated one of two nodes of the ARPAnet project, the foundation of what we use today. Questions will be taken over Twitter using hashtags. Well, the addition of a carrot to the broth was a success from the last batch. Today, we are adding fresh Rosemary at the recommendation of my friend Stephanie Lemus. She says that the 2 tablespoons of FRESH Rosemary instead of dried makes a huge difference. I’m curious as to what sort of difference it makes but nonetheless trust her judgment when it comes to food considering I’m an engineering hack and she’s an award-winning cook that’s actually competed for money. I, on the other hand, am still trying to find people to eat my experiments other than my wife. I also added a single tablespoon of parmesan cheese believing that this might be the savory taste that is missing. It clearly needs something to create a more complete flavor and I’m hoping this is it. I am continuing to use a bottle of Stella Artois as the beer of choice for this broth however the only reason I haven’t shifted to a deeper beer like Guinness is because I don’t have any and keep forgetting to buy some at the local grocery. Maybe next batch. With about 2 cups of the original batch just mixed, we now have the complete broth simmering for the next hour or so. I’m eagerly anticipating the outcome of the great “Parmesan” experiment as it could be a big departure from what I’m used to. Fry onion, celery, carrots, garlic in the butter until fragrant and soft in a large pot. Stir beer & cheese into the broth mixture as well as PREVIOUS batch of Killer Shrimp and continue to simmer and occasionally stir 2 hours. While the KROQ Weenie Roast 2010 is not until June 5th – there’s an audio stream with it’s bands available for listening beforehand. When last I wrote, I was still whipping up experimental batches of Killer Shrimp based on recipes gathered across the Internet. This should serve as documentation of my 4th attempt which incorporated not only the changes from the various web sites that I’d examined but also the advice of my wife. 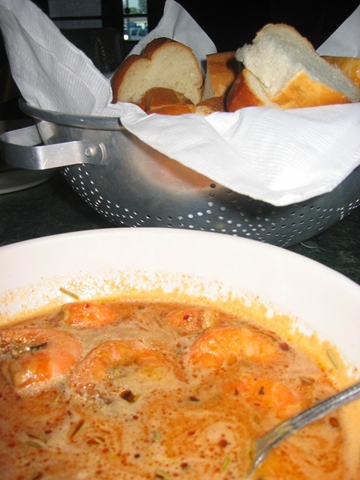 In the last batch, I was struggling with the fact that the tongue-wagging, center-of-one’s-palette, ‘savory’ taste of Killer Shrimp that compels one to eat & eat & eat mouthful after next of bread dipped in the red-orange broth was still sort of missing. I concluded that it was possible that it was the process itself that created this flavor: In other words only after creating a batch of the broth could one create a more perfect broth by using the initial batch as a base. So indeed, I saved 2 cups of the original broth and added it during the beer phase of the cooking process with the intention of mellowing out the flavor and making it more well rounded. I also cooked up the batch then let it set overnight to see if that helped, as this often makes many meals I have attain a better balanced, fulfilling taste. Additionally, my wife noticed that something needed to cut the flavor a little. She thought of adding plain sugar at first but we decided to think about it. It then dawned on her that the addition of pre-softened onion & celery from Jaden Hair’s recipe sounded awfully close to just simply kickstarting the dish with something called “mirepoix”, a traditional flavor base for many French dishes. Considering that Killer Shrimp’s origins were from New Orleans’ cajun/French quarter, it would make perfect sense that this recipe started with a complete “mirepoix” stock. Being that the only thing missing was a carrot, I decided to simply just add it to the preparation. THE BEER. AND IT’S DEFINITELY BEER. Just a note: I’d written that I had some question as to whether or not the recipe required wine or beer, and in the end, I believe it really is beer. My friend Steph concluded that the beer’s more robust flavor greatly contributed to Killer Shrimp’s unique gusto and I agree. The end result was very good however I discovered something of a backlash from the pepper used. Because I simmer the broth down so much, because I may have overchopped the spices, and because I added the previous batches broth to the mix, it came out overly hot and the pepper sadly detracted from the broth’s overall taste. So if you make this, keep in mind that reducing the pepper may be necessary if you simmer down the recipe too far or use a starter broth. Changes made to the recipe have been highlighted in bold font. 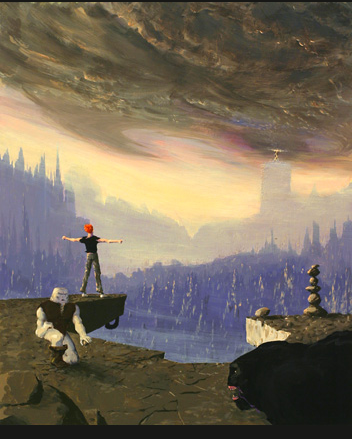 1991’s critically acclaimed 2D adventure game, “Another World”… now on Windows! 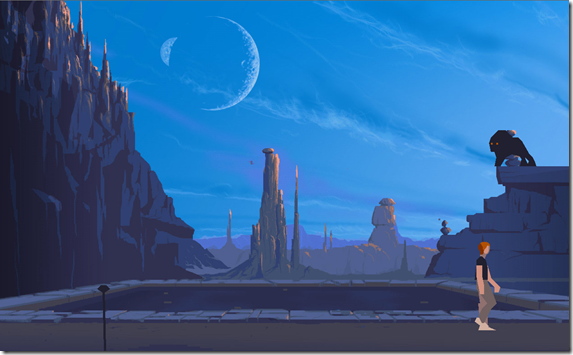 Back in college, there was this one game that had me captivated called “Another World”. And it wasn’t just me – the resident dorm geek. I honest to God had guys, girls, sports jocks, everything all watching this game trying to figure out how to solve it’s puzzles and find out “what happened to Lester”. So much so that when some of us finished parts of the game, we’d have to summarize what had happened and leave it on a piece of paper on my dorm room door for people to read. YEAR: This was 1991. The computer I ran this on was a 16mhz 80386 with 640k. SIZE: The game was 1.28MB. It fit on a single floppy disc. I’ve got Word .DOC files that are bigger than this, much less a video game. FRAME RATE: The game moved so smoothly – it was like a movie and with the cinematic cut scenes, it was kinda revolutionary. MUSIC: The game had actual atmospheric audio & sound effects all throughout. Even alien language. GAME LENGTH: The amount of time it took to play through the game wasn’t huge but the puzzles were tough enough that it could take quite a while to complete a level. It took me more than a a few months to play through off and on. ANIMATION: Everything generated on the screen was VECTOR based. This was a first – no one had ever constructed an adventure game made of vectors instead of raster objects & animations until Another World. The story is outlined in the Wikipedia entry but the net of it is a PhD researcher working with a cyclotron attempts to produce antimatter but in the course of events, a lightning strike results in a cataclysmic failure resulting in the mysterious teleportation of our hero to ‘another world’. Rematerializing underwater, he swims to the top of the pool – lest he be eaten by an unseen tentacle laden creature at the base of the pool – and discovers… well… the world you see above in the photo. Our hero in the photo has just gotten out of the pool in the picture and in the horizon, there is a “beast w/ red eyes” of sorts that he eventually has to deal with. Thankfully, they’ve put a trial version on the net for people to play… and if you like it, there’s a link to buy it for $8.99. WINDOWS – It’s no longer a DOS game but completely ported over to Windows. What’s neat about this is the game now scales to either full screen or a windowed environment. Also it’s no longer constrained to 640×480 but rather works at any resolution – remember: The game is vector–based so it looks GREAT at any resolution and doesn’t pixelate like other raster-based titles. ENHANCED VISUALS – Originally designed for 80386 computers and a 640k footprint, today’s computers have a bit more power and memory available to them. So the creator, Eric Chahi made some modifications that improve the graphics for today’s PC’s while maintaining the same vector-based look & feel of the original. The changes are very subtle like shadows, background detail, & lighting however very noticeable. You are currently browsing the Kurt's Thoughts blog archives for May, 2010.